Last weekend my husband and I visited the new Kentucky Fried Chicken (KFC) restaurant which opened a few months ago in Banbury. Sat there, tucking into my Zinger Burger (it’s a classic), we both, independently, commented on how the restaurant had quite a different décor to what we would normally associate with KFC. It had the hard-wearing plastic seating, which will survive a thousand bums, and the easily wipeable table tops, but it also had a distinct hipster, farmhouse kitchen vibe. It had butcher block-style, high bar seating; timber plank kitchen tables; texture effect faux brick walls; and low hanging copper lighting. I later looked this up and turns out the new interiors were rolled out nationwide in 2015 (that just shows you how long it’s been since I had that crispy golden chicken) and encourages a family atmosphere like that you’d get around the eponymous farmhouse kitchen table. Our recently refurbished restaurant also had a new digital ad board which rotated a number of ads all with the tagline ‘100% British Chicken’. Here is KFC clearly trying to tell a different brand story to customers – one that is about authenticity and provenance from farmyard to family bucket. But somehow it felt rather inauthentic. It’s not that I don’t believe that KFC does use 100 per cent whole British chicken (in fact, all its suppliers are Red Tractor certified, that’s a whole new blog post subject if you’ve read this week’s Grocer story). It’s more the fact that this message is used as an ad slogan. It’s a bit ‘doth protest too much’ or too much telling and not enough showing. There was no other obvious information on the provenance of the chicken breast in my burger available to me whilst I chowed down. Similarly, its ‘Whole Chicken’ tv ad, which featured a strutting chicken, felt too lighthearted when dealing with serious subjects like food origin. Unlike other fast food chains, I felt that KFCs attempt at telling its provenance story fell short. 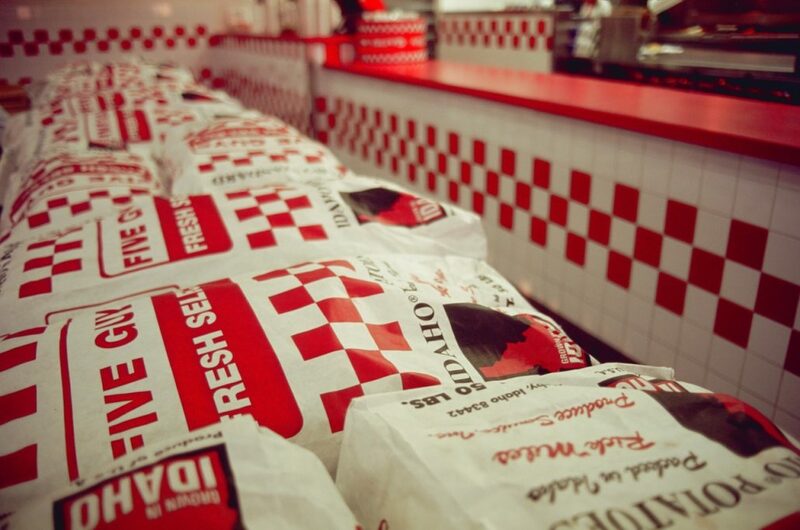 It could learn lessons in storytelling from Five Guys, the burger chain. That week’s potato supply is always the restaurant’s core feature and there’s always a sign showing the variety and where in the UK it’s from. There’s the open kitchen, where you can watch food preparation from behind the glass. The restaurant’s diner décor feels far more authentic because it’s about being able to see it in front of you, not just about being told about it. Don’t get me wrong Five Guys likes to reaffirm to its customers how good it is, but it does so without showing its own ads to its own customers in its own restaurants. Instead, the chain’s restaurants have walls plastered with media cuttings of other people saying how marvellous the burgers are. Last November at Influence Live, Rob Robinson, co-founder of Notes, a coffee chain based in London, talked about the importance of provenance to consumers. His customers want to know where his coffee beans are grown and where are they roasted. Organisations large and small can build provenance messages into their brand storytelling. We work with Matthews Cotswold Flour, a traditional, family-owned mill based in Shipton under Wychwood in Oxfordshire. It specialises in premium organic, continental and speciality flours and uses Grade 1 grain, the highest available quality. Importantly, the flour isn’t just milled in the Cotswolds but the company sources as much local grain as possible – but it does have to meet stringent quality tests. Here the mill’s geographical location plays a central part to its brand storytelling – the packaging displays a picture of third generation mill owner, Paul Matthews; the blog, which has recently been rejuvenated, at the moment, is dominated with pictures of the local harvest. Perhaps what is most powerful are the members of the public who share pictures of their bakes on social media using Matthews Cotswold Flour. They are praising its baking capabilities and its taste, attributed to something akin to the ‘terroir’ of the Cotswolds and the unique atmosphere at the mill. Provenance is not just applicable to food brands either. Another client, Europe’s second-largest steel producer, Tata Steel, has dedicated web pages to its responsible sourcing of steel and tin to make its packaging steels, including the amount of steel recycled into new products. These messages are filtered through its other marketing channels including staff Linkedin blogs, social media and regular columns in trade magazines, such as CanTech International. For its target audience, in this case, canmakers, ethically sourced raw materials are incredibly important for creating metal packaging that’s part of a truly circular economy. Once again provenance is taking centre stage. What does this mean for KFC? Well, I felt that its full-page ad ‘Fck’ following the chicken supply blunder has been its most effective piece of brand storytelling this year. Here you felt like a real person was admitting the shortfalls – it was as Frank PR’s Andrew Bloch tweeted, “a masterclass in PR crisis management.” And it was warmly received by fans of the chicken bucket. If brands treat provenance lightheartedly, reducing these serious messages to ad slogans and marketing puff, consumers remain simply unconvinced. On the other hand, if treated with respect, care and embedded at the heart of brand storytelling it can be a powerful attraction to consumers and inspire fierce loyalty – just look at those Matthews Cotswold Flour bakers. If you’d like some help getting to grips with your authentic provenance story, then get in touch – Jessica@twelvepr.co.uk.